The Kampa Portaflush 10 is a compact flush toilet ideal for camping, caravanning, boats and outdoor events. The portable toilet holds a 12 litre fresh water capacity and provides up to 50 flushes before needing to be emptied, made from a thick wall construction the portable Kampa 10 is and built to last. Featuring an attractive matt finish that conceals scratches and marks the double sealed valve protects against leakage and odours. 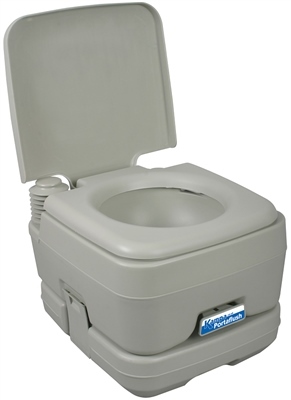 This easy to use and empty Kampa Portaflush 10 is perfect when going away exploring the great outdoors and want that extra home comfort of a nice toilet. Thick wall construction - strong enough to stand on! I've been very happy with the Kampa so far. Easy to use, very portable, no smells whatsoever using the correct liquids. Also very easy to empty. It wouldn't be much use for a long trip because of the capacity, but I guess that's why they make the bigger version. Simple, light and portable; easy to empty. When I bought my boat in 1998 from the Detroit Boat Show it had this potty installed. After many years of using it, it was time to replace it. I wanted to have an exact replacement and this fit the bill. I tried to find it cheaper in the States to no avail. So, do I recommend it? Absolutely! Bought one of these just before the Easter break to go away ith our new camper van, it was very very useful especially in the middle of the night. Easy to clean, easy to empty and re-fill too. This is our new addition to our camping gear.not used it yet, but we're hoping it is going to be ideal for the kids instead of walking through the camp site in the middle of the night. Bought this for the kids to stop mid night time trips to the toilet. Good quality item which is compact and easy to use. I wish I bought one sooner.